How do I change the Magit section heading background color? I'm trying to customize the look and feel of my Magit setup. How do I change the background color of the section heading below? In particular, I'd like to change the black background color next to the "Unstaged changes" text. The Unstaged changes line is not a section heading. Sections and their headings are part of the buffer text, but this line is not part of that, otherwise it would not stay in place when you scroll the buffer. Instead this text is being displayed in the header-line. 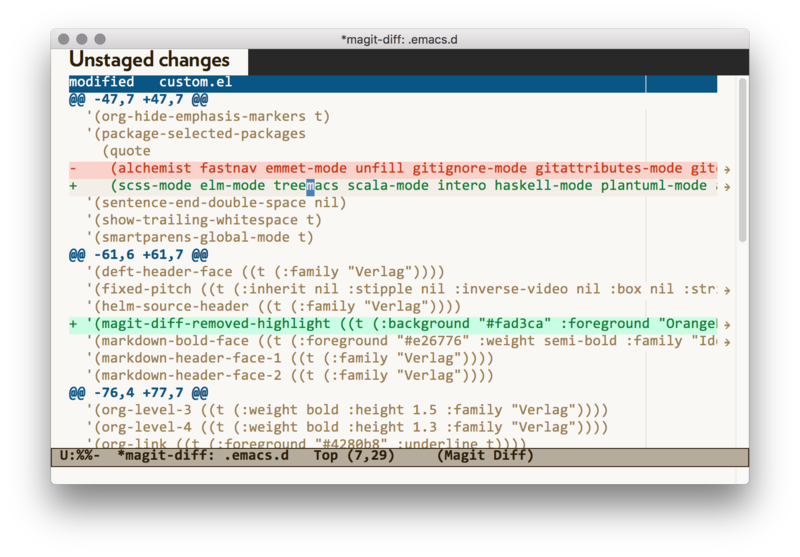 The face that controls the Unstaged changes part is magit-header-line. The rest of the line is styled using theheader-line` face. Not the answer you're looking for? Browse other questions tagged magit faces customize or ask your own question. How can I override a pre-defined face for light and dark backgrounds? How do I find the variable or lisp code controlling a face at a particular column?